All the King’s Men is pleased to announce the release of Napoleonic French cuirassiers! These French heavies are 54mm, like all our figures. Riders are cast in metal, while horses and bases are plastic to keep sets lightweight. Assembly is required on the riders who come in the following pieces: body, head, arms, scabbard, carbine and bedroll. Pieces fit together snuggly and are easy to superglue. The result is riders in various poses. You get 8 figures in each set: 6 troopers, an officer, a bugler, and 8 horses with bases. 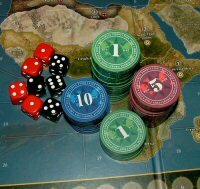 This setup is ideal for “All the King’s Men” wargames, but you can use these figures for any game or display. A set is $45 USD before shipping. ATKM ships worldwide. The figures come UNPAINTED. Images here show how they can look painted. 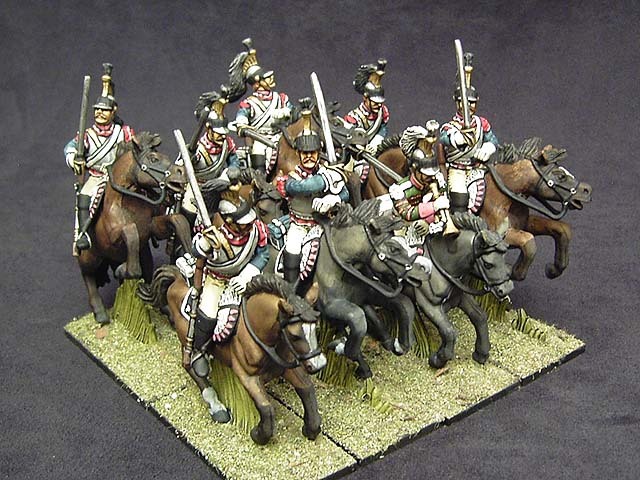 The original riders in this set are owned by Stockade Miniatures in their Soldiers of the World range. We made arrangements for ATKM to offer them to the wargame audience. The horses are from DSG of Argentina. They’re cast from the old Britain Deetail molds, which DSG has owned for some time.